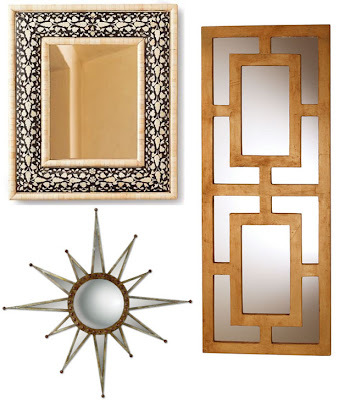 Top left, clockwise: Agra Mirror from Gump's San Francisco; Gilded Open Work Mirror via Arteriors Home; Sitara mirror from Uttermost. 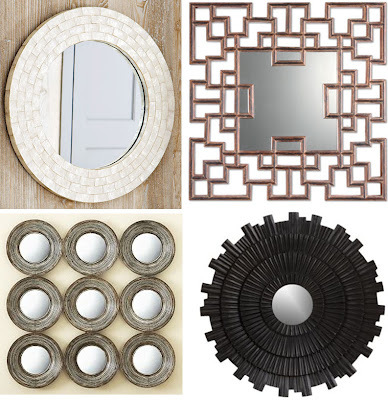 Top left, clockwise: Laminated Capiz Mirror via west elm; Randall from Uttermost; Grier Small Mirror - Crate & Barrel; Convex Mirror Panel from Pottery Barn. great post, i agree about the mirrors adding their own impact, i personally love the randoph mirrors the best, i'm a sucker for a more vintage frame. fabulous. The white one is so pretty! 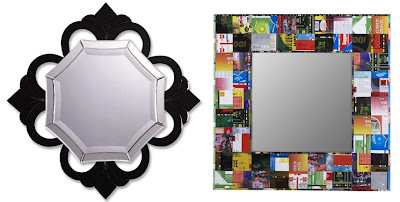 I've never seen the mirrors from Shine Home- they are gorgeous!! Lovely collection of mirrors to view your black Oscar de la Renta gown or gold Gucci dress... don't want to look out of place in the market! 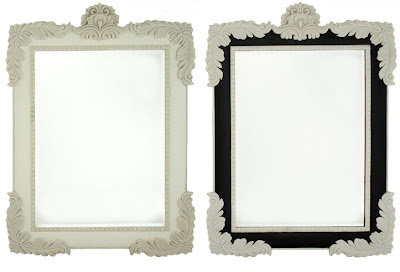 Flea markets are a great source for affordable mirrors! I love fancy mirrors. I was watching the daily 10 the other day on E! and they were showcasing CC Skye's boutique. She has the most amazing glamorous mirrors in her shop! Great choices!!! all such pretty options! i've been collecting gold, vintage frames for a while and i'm going to eventually group them all together. These are wonderful. I have a thing for mirrors (as I have a thing for a lot of things, lol), especially convex mirrors. This is quite a handsome selection. I always find ways to add them to my home without looking too vain, but I do like how they reflect the room and the light. I also have a habit of putting them at odd heights, treating them more like artwork than something functional. I've been gone for few days and you have some great posts to catch up on, yay! (btw, I tagged you on my blog). oh so many choices. i don't know which i like more. I love mirrors - these are pure greatness! A great place to find beautiful, grand mirrors is Hobby Lobby. I have found many lovely mirrors there, including my favorite art deco mirror in my living room. i love mirrors. I have them through out my house, especially the smaller areas.